A federal judge said voter registration has to stay open until at least May 21 in a special election to replace Tom Price. Democrats hoping to elect a blue candidate in a red district are applauding a major ruling Thursday. A federal judge ruled the voter registration deadline for a runoff election in Georgia's 6th District has to be extended to include voters who didn't cast a ballot in the initial election. Democrat Jon Ossoff is hoping to upset Republican Karen Handel. Georgia's 6th hasn't elected a Democrat since 1976. The seat they're running for was left vacant by Tom Price, who now runs the Department of Health and Human Services. Georgia law says that the only people who would be able to choose between Ossoff and Handel on June 20 are people who voted between 18 candidates on April 18. But Georgia civil rights groups said that conflicts with federal law, which keeps states from setting voter registration deadlines more than 30 days from an election. Now, Georgia officials have been told to let people sign up to vote until at least May 21. 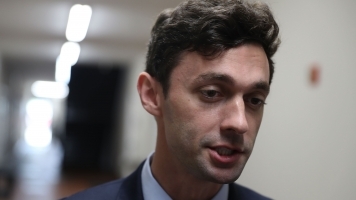 While Ossoff reacted to the ruling by encouraging voters to register, Handel said, "When the Democrats can’t win Elections following the rules ... they file partisan lawsuits to change them." The race is tight. New internal polling from the Ossoff campaign shows the young Democrat is only one point ahead of his rival.